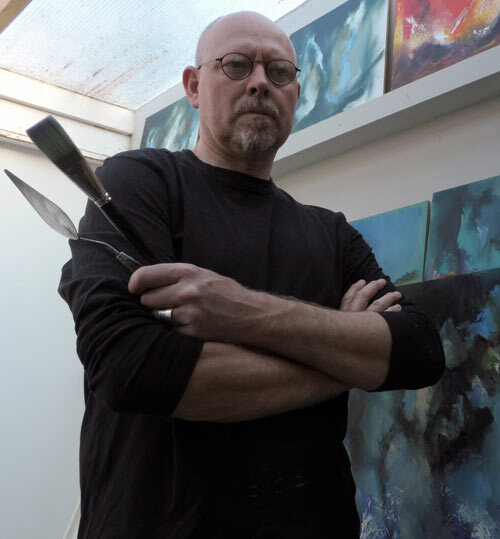 Although my paintings encapsulate a static moment in time, they have to attempt to re-live the atmosphere experienced at their time of creation. This means translating varying moods to the viewer. Sometimes it can be turbulent storm winds building over a restless sea, other times foaming spray exploding against granite rocks or maybe the warmth of the bright sun radiating across a clear blue sky. I use my enthusiasm for strong colour and contrast to create a striking visual focus, complimented by structural marks which lead the eye into and around the painting. I use various mediums to achieve my goal including charcoal, Indian ink, pastel, watercolour, acrylic paint & acrylic ink, however oil paint is the main focus of my work. I sometimes use several mediums in a painting which are applied over a period of time building layers of intrigue & texture. Because of my working methods I favour the stability of a solid panel for many of my paintings which are then framed, giving further depth and a contemporary presentation. My studio is located in Dorset giving me good access to coast and countryside and as most of my work is based on interpreting the feeling of being outside in the natural world, it’s an ideal base for painting directly from the elements. You may find me stationed on a clifftop or studying a brooding sky somewhere in Dorset attempting to capture the face of nature. I have exhibited in Dorset, Wiltshire and Hampshire and have sold to collectors from England, Australia and the U.S.A. My paintings are available to buy directly from my online shop and I welcome any questions from people interested in my work.